This is my first post. 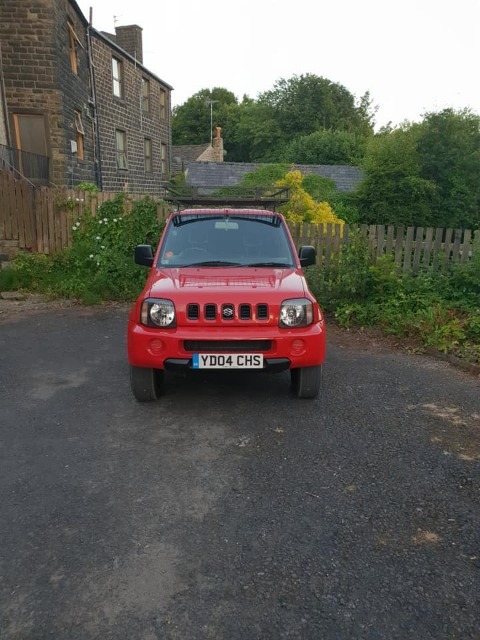 I brought my Jimny 04 Reg back in November last year and have been reading and planning the upgrades. The very first thing I've done is change the speakers in the front to some 4" Alpine SPG-10c 45 Watts RMS. I have another set for the back but haven't got around to fitting them yet as I'm a little scared that my head unit wont be able to power them and I will have to buy a new unit. Plus I've hot a Kenwood powered enclosed sub woofer (KSC-SW11) to install but again might need to get that new head unit first. I have had the rear windows tinted - love it. The kids now don't get roasted on long journey's and it is keeping noticeably cooler in this HOT summer! But to get to the point, I've had a galvanised steel rook rack made! Then when I got it home on Saturday I painted it black with a little help from the rolling stones! What do you guys think? I'm well chuffed. Off camping this weekend to test it out. I just need to put something on the matt black paint to stop it from chipping. Hope you like. 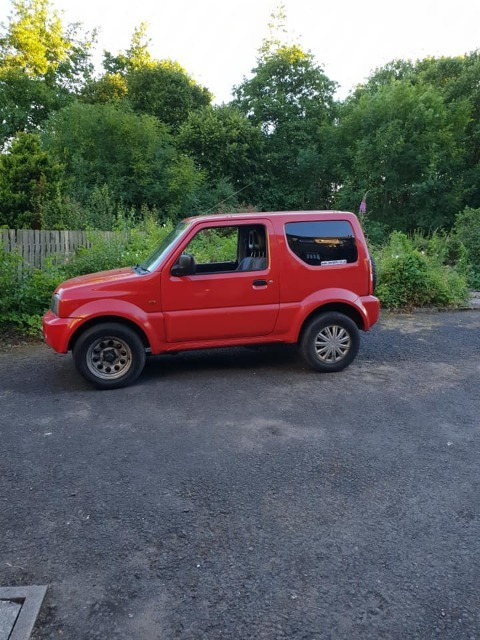 Next is new Suzuki 15" Black 7" Modular Steel Wheel -30 offset from Jimnybits and some Summer Tyres 215/75 R15 BFGoodrich 100/97S ALL-TERRAIN T/A KO2 once i know they will fit! Last edit: 05 Jul 2018 16:50 by Richdmt. Very nice. 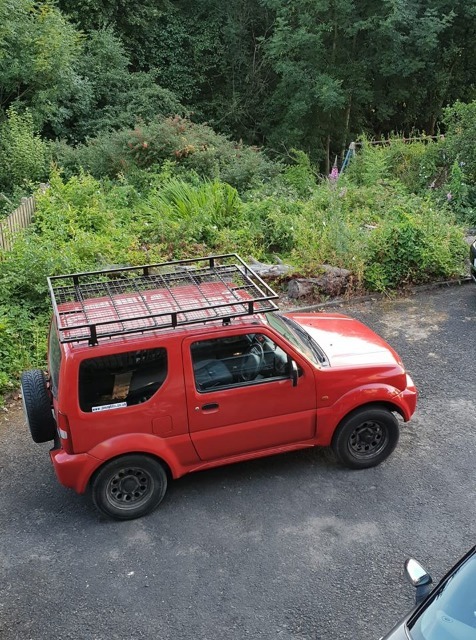 I have looked at the roof rack in the past and whilst a direct bolted metal one like you've got is a lot more sturdy the roofs cargo limit remains at 30kg as far as the insurance are concerned and even declared they'll doubtlessly use itas a reason for refusing a claim if at all possible. Looks good though. Here is another picture of the rack to give a better view - I painted it black myself as it was fabricated with a silver coat - hopefully will get some pics of that soon as well (had to change it as it looked like a giant shopping trolley). I read else where on here that the 30kg limit was on the original roof bars because the feet are made of plastic. I have told my insurance company and they don't have problem with it, but as you say the proof will be in the pudding. I have had over 30kg on there as I took it camping last weekend to test it out. Now i desperately need that 2" lift with new springs lol but wheels and tyres are turning up this week hopefully.